Television weddings capture the glamour and drama of true love. These fictitious ceremonies also provide the ideal inspiration for couples in the midst of planning their own dream weddings! The nuptials of our favorite characters have captivated viewers for decades. In 1981, Luke and Laura’s epic wedding (and Laura’s insane ‘80s gown!) made ratings history on General Hospital. And the 2015 season of Outlander saw Claire Randall donning a stunning 1700s period wedding gown as she exchanged vows with Jamie. While most brides can’t spend a small fortune for the same high-end—and in some cases couture—wedding gowns they see on television, similar styles may be found in many bridal boutiques for a fraction of the price. 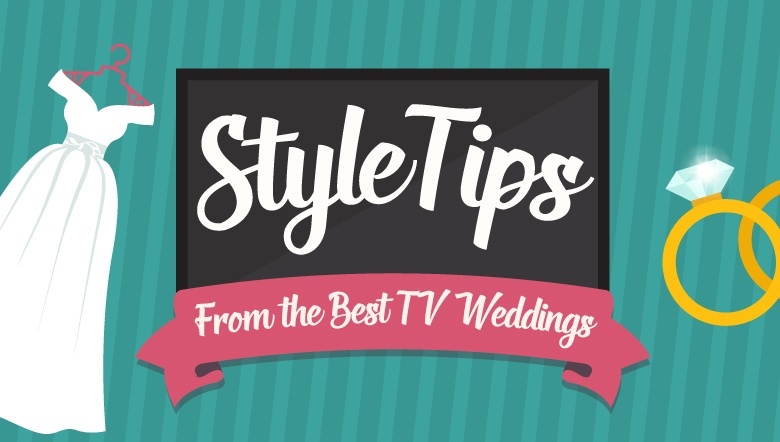 Television weddings also can help couples discover new décor ideas for their ceremony. Monica and Chandler’s wedding on “Friends” featured red rose petals scattered along the aisle (Monica also carried a bouquet of red roses). And, on “Gossip Girl,” Blair Waldorf married Chuck Bass with the Bethesda Fountain in the backdrop. Blair’s dress also was a gorgeous blue… not the typical white. Television shows like “Ace of Cakes” and “Cake Boss” also act as influencers for couples seeking out the most unique pastries and cakes for their weddings. Because sometimes a bride needs a Hogwarts Castle wedding cake! Or a beach-inspired wedding cake.